Siliconfile Looks for a New Direction? Recently it came to my attention that Siliconfile has submitted a slew of patent applications on 3-D stacked image sensors, Si-Ge-based sensors and sensors with protruding photodiodes. These new ideas are quite a departure from its current offerings. It looks like the company is in search for a new product or market. Indeed, it's hard to compete in the mainstream these days. Even though Siliconfile has quite a strong portfolio now, it might find it difficult to remain competitive in the pixel size race. Electronic Design published an article about Dongbu pixel improvement ideas. Most of them are quite common in the industry, but it's funny to see that everybody and his mother in law think alike. Physorg.com: Researchers at UC San Diego have built an ultrathin digital camera by folding up the telephoto lens. This technology may yield lightweight, ultrathin, high resolution miniature cameras for unmanned surveillance aircraft, cell phones and infrared night vision applications. "This type of miniature camera is very promising for applications where you want high resolution images and a short exposure time. This describes what cell phone cameras want to be when they grow up," said Joseph Ford, a professor of electrical and computer engineering at the Jacobs School who leads the camera project within UCSD's Photonic Systems Integration Lab. This kind of lens folding has not been widely implemented as a means to slim cameras down, but recent advances in the mechanical machining process of "diamond turning" are changing that. The engineers used a diamond tip to cut all the reflective surfaces onto a single calcium fluoride disk. "You mount the optic once and the diamond machining tool cuts all the optical surfaces without having to adjust the setup," explained Eric Tremblay, the first author on an Applied Optics paper published February 1, 2007, and an electrical and computer engineering Ph.D. candidate at UCSD's Jacobs School of Engineering. Not having to realign the optic during the machining of the reflective surfaces reduced an important source of error and helped make folding a viable approach for camera slimming. Virtual Press Office: In a surprising move Varioptic announces the launch of the first liquid lens auto focus camera module - AFCM MI285. So now Varioptic becomes a camera-module supplier. It has been developed using Varioptic's latest auto focus 7.75mm liquid lens - Arctic 416 - allowing one of the smallest footprints (8.5 mm) for a 2MP camera module. 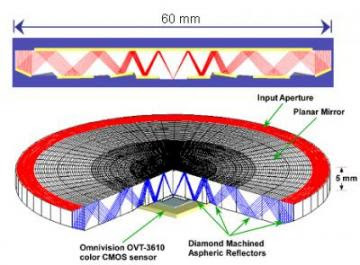 The AFCM MI285 camera module is manufactured by "one of Varioptic leading Asian partners", and the Arctic 416 lenses are manufactured in Wuxi (China) by Creative Sensor Inc. It's offered at $16 at volumes of 50,000 units. John Barber, Vice President of Business Development at Varioptic said: "Although Varioptic remains focused on developing and producing liquid lenses, we saw this opportunity with one of our partners as too good to miss. Our AFCM MI285 is a stepping stone to the first camera phone using a liquid lens. We are already working with a number of handset companies to achieve this and should be announcing the first camera phone in the coming months." "OmniVision orders accounted for 71% of XinTec's revenues in 2005, and about 30% of the world's cameraphones adopt image sensors packaged by XinTec, according to industry sources." Pentax engineers are usually more open talking about technical problems than their collegues from other companies. OK1000 Pentax blog translated an interview about K10D DSLR design and decision process at Pentax. "It doesn’t take long to produce an acceptable level of quality images at the base sensitivity (ISO 100), however, as the sensitivity increases step by step, at some point, terrible images will be produced. The real effort starts from this point, trying to pin point possible reasons, mainly by trial and error, often having to make new Cbs (circuit boards). At the same time, firmware is developing along and each group has to closely coordinate in order to slowly improve image quality. Fine tuning can only commence after this point. The frequency of designing new circuit boards might be hardest hurdle in the whole K10D project. Homogeneous noise across the whole image could often be permitted, but countermeasures against localized noise is difficult to achieve. Of course, each case is closely analyzed and dealt with, but there are a number of cases of localized noise and it is really time consuming to solve these. Changing Cb’s is one measure, but that has to be repeated many times. We were fully aware that we were going to face very critical eyes on the noise issue because of increased resolution. In addition, the base sensitivity of the sensor was lower, which made tuning to the acceptable level for production very difficult. Recent Cbs might look at one piece, but there are actually layers to this and a slight change in wiring alone significantly changes how noise appears. In a digicam, DDR2 memory that functions at a very high frequency and many other parts all produce radio waves. A TV tuner portion of a videocard for PC, for example, is tightly shielded in order to avoid the interference between the digital circuit and analog circuit. If noise enters before signal’s digitization, the digital image output would almost be unusable. When increasing the gain for sensitivity, at ISO1600 for example (4 stops over base sensitivity), just a slight voltage variation in the order of a few milli-volts will impose a huge impact on image quality. Separating grounding circuits is one way, but it is not simply a matter of separation. Sometimes, good results could be obtained by a larger grounding area. This is another area requiring the trial and error method." Some other design trade-offs and considerations of DSLR image sensor customers make this interview worth reading. Acutelogic is yet another embedded image processing software vendor. It has quite a complete set of image processing routines, covering wide set of applications. Canon,Fujifilm, Pentax, Samsung are all among its clients. "Image stabilizer software for still images and video--Being a pure software implementation, this application requires no additional hardware such as gyro-sensors. Our still image stabilizer results not only in reduced blur but improved noise characteristics when used in low-light conditions." Sounds like they are solving the holy grail of digital imaging. I'm wondering if it's a similar idea to Sony 60fps sensor stabilization? Or it's like Stanford's Abbas El-Gamal solution squeezed into OMAP footprint in some magical manner? SourceWire: As announced in August 2006, Creative Sensor set up the production line for liquid lenses with the support of Varioptic. The manufacturing capacity in Wuxi, China is now at 100,000 liquid lenses per month and will be increased to 1 million units per month by the end of 2007. Production includes Varioptic’s new 7.75-mm lenses, Arctic 416, aimed at camera phones, as well as the previously introduced devices, Arctic 320, for use in webcams, barcode readers and medical equipment. Photron has announced world's fastest Mega-pixel video camera, having over 5,000fps at mega pixel resolution. Its brand new CMOS sensor provides 12b pixel depth and is capable of reduced resolution operation as fast as 150,000 fps. 5,000fps at megapixel resolution frame translates to about 200ns per row, depending on the image format. Even considering 2-sided readout of few rows in parallel, the speed is very impressive. Most probably the sensor was developed in cooperation with Alexima. BeSang start-up company (Portland, OR) promises new "high quantum efficient image sensor" based on its "3D Enabling Technology". From the first sight its chip stacking technique is quite similar to ZyCube. The company was founded by Sang-Yun Lee, who used to work for Samsung, Motorola and IDT. It looks like BeSang does not have institutional investors, as of yet. EETimes: In the report about changing Crolles facility charter, ST CEO Carlo Bozotti mentioned image sensors as 32nm process extention to be developed in Crolles. I wonder what pixel size ST gets in that process? 0.6um with full well of 1000e-? EETimes: ZyCube and Oki Electric combine their technologies to offer chip-sized packaging technology for both CMOS and CCD image sensors. ZyCube 3D CSP will compete with Tessera-Shellcase CSP. Oki seems to be the early adaptor of this package, just like Sanyo was for Shellcase at the time. On paper ZyCube package looks extremely attractive, albeit a little complex. But the real question is can it compete on price and yield? EETimes: ProMOS said it will invest $360 million in the 200mm wafer fab in the city of Chongqing that will produce CMOS image sensors, among other ICs. State-controlled banks will lend another $360 million, while the Chongqing government will put up about $200 million to build the fab, and then lease it to ProMOS. If things go well, ProMOS will eventually buy the facility. The clean room should be finished by the end of this year. Mass production will begin in the second quarter of 2008. The planned capacity is 60,000 wafers per month. ProMOS will buy new equipment for the first 20,000 wafers, and then transfer used equipment from a fab in Taiwan for the rest. Initially, ProMOS will use 0.25 micron design rules and then migrate to more advanced technology as the fab reaches full capacity by 2009. Digitimes presents a slightly different ProMOS fab schedule: ProMOS first 8-inch fab in China at Chongqing will have pilot runs slated to start during the end of the year and volume production slated for the first quarter of 2008. There is one more Planet82 demo setup video from CES. ESMChina put out Micron's presentation of products for security market. My favorite number in it is 82.1 patents per 1K employees per year, which puts Micron into leadership position. Sounds quite funny. I can think of this number expressed as 82.1 Kilo-patents per 1 Mega-employee or as 82.1 milli-patent per employee. In Kilo-patents it looks bigger. "The novel hybrid image sensor combines the best of both CCD and CMOS technologies: the high image quality, low dark current and high fill-factor of a CCD with the high speed, low-noise and low power of a CMOS readout. The 1.3 megapixel hybrid sensor delivers extreme low-light imaging performance at video and supra-video frame rates." To me this sounds like a regular 4T pixel sensor, may be fabricated on CCD fab in CCD-compatible process. Personally, I'm sceptical about Fairchild Imaging capabilities to deliver a real breakthrough here. Update Feb 4, 2007: Fairchild Imaging published a paper on the hybrid imager approach. It's quite an exotic imager having CCD combined with column-parallel CMOS readout attached on indium bumps. The chip was developed under US Army contract. Quite an expensive technology, even for military. Tech-On: Sharp announced a 8MP CCD with 1.75um pixel pitch, which is claimed to be the industry's smallest in class. Sample shipment is slated for the end of January 2007 and volume production and shipment are for April 2007. Lyra Research published its digital camera market forecast up to 2010. According to the forecast worldwide digital camera shipments rose 21 percent in 2006 to approximately 98 million units. This sizeable growth occurred despite household penetration of greater than 50 percent in Japan, the United States, and leading nations in Western Europe, and in spite of multimegapixel camera phones becoming commonplace in Asia and Europe. Lyra's forecast now projects worldwide digital camera shipments to exceed 130 million units in 2010 for a compound annual growth rate (CAGR) of more than 10 percent. Sales in 2006 showed that consumers' appetite for digital cameras has not been abated by the spread of camera phones or by existing digital cameras in the household," comments Steve Hoffenberg, Lyra's director of consumer imaging research. "Current digital camera users upgraded in droves to new models offered by every major manufacturer, lured by image-stabilization features, broader zoom lens ratios, and higher-resolution sensors. While the upgrading activity will eventually taper off, it shows little signs of vanishing through the end of the decade, as camera makers continue to pack more value into their products." Yahoo-Finance: J.P. Morgan analyst Paul Coster wrote in a note to investors: "OmniVision is locked in price-based competition in the low-margin VGA segment of the CMOS sector space . . . and is unable to differentiate, absent the introduction of WFC (Wavefront Coding) or a lower cost next generation chip set." It just came to my attention that Andy Harvey from UK Heriot Watt University made a lot of work on the fashionable wavefront coding technology. Sony significantly enhanced its on-line 60fps sensor flash presentations. It seems the time of high-speed consumer cameras is close. It sounds like more fabs in China are offering CIS foundry services. One is HeJian, having 0.18um CIS Process now and 0.13um Al CIS pilot production starting mid-2007. The other is Hua Yue Microelectronics. A little is known about this one, other that it offers foundry services. They join another two CIS-capable fabs in China: SMIC and Grace Semiconductor. A year-old Magnachip paper comparing optical properties of Al an Cu backend pixels just came to my attention. Not really fair comparison as the metal stack hight is almost same in their simulation. It shows what happens if one does not remove SiC or SiN barrier layers in Cu process - quite predictable result. Laser Focus World published an article about Synopsys tools for pixel simulation. I've just noticed that Canadian company Lumerical offers an optical microlens FDTD simulator. It seems to be in use by ST, looking on a footnote. Breault Research has 3um pixel microlens simple simulation examples using Lumerical FDTD. They also published a paper about it. There is a competing FDTD simulator by OptiWave, incidentally also Canadian company. Stanford students use it for pixel simulations, as described in the paper. Anybody can share an opinion on these simulators, good or bad? How they compare with TOCCATA by Link Research or Sentaurus by Synopsys? "For a given sensor size—and hence price range—increasing the pixel count means decreasing the active area of the photodiode, and hence lowering the sensitivity and/or the signal-to-noise ratio. Already in the 6-megapixel range, sensitivity has been reduced enough to seriously compromise image quality at low light levels. One possible solution comes from Toshiba, which is working on a way to get more light to the active area. Today the individual microlenses that are bonded onto the surface of the image-sensor array are circular—so the lens doesn't collect light from the whole rectangular area of the pixel cell, only from a circular area that fits inside the rectangle. Toshiba researchers are working on a rectangular microlens that would cover the entire pixel area, substantially increasing light-gathering efficiency." Well, Micron has these high-quality microlens for years. Toshiba is catching up here. "Toshiba is also working on the system-architecture problem. In many cell-phone handset designs today, even the pixel-level post-processing to remove noise and bias from the raw CMOS sensor data is done on the handset's baseband or applications processor. But, according to Toshiba vice president Andrew Burt, while that solution is attractive to platform developers for cost reasons, it is losing its appeal with handset manufacturers, who find that the design team that created the sensor should remain in control of the pixel-level processing. This is tending not only to put the pixel-level signal-processing hardware back on the sensor die, but also to enlarge the definition of what needs to happen at the pixel level. "As resolutions approach 5 to 8 megapixels, we see image-processing applications migrating onto the pixel processor," Burt said." I think this is another way to say that sensor's raw data is so bad that it's a shame to show it to anybody without at least basic fixes on the sensor itself. "At least one insider sees video cameras heading down the same road. Cameras are moving to true HD: 1080-line, progressive-scan imaging. That means the consumer is going to be looking at the output of a handheld camera on an HD screen in high resolution. The consumer is not going to be happy. Part of the problem is refresh rate. "Hollywood can make movies at 24 frames per second," observes Didier LeGall, executive vice president at Ambarella. "But they have professional cinematographers and specifications written right into the script about how fast a pan or zoom will be, how a camera will track, how fast the hero will run across the scene, and so on. A novice recording HD sequences with a handheld camera, swinging it around, zooming in and out, is going to create flicker and motion artifacts at anything like a 24 fps refresh rate. That is one of the reasons the industry is moving rapidly toward 120 Hz." "Mosesmann and other analysts say Apple apparently has chosen a Micron image sensor for the iPhone's 2-megapixel camera. Companies that make chips for i- Phone will get a real plum in sales. Apple expects to ship as many as 10 million iPhones a year by 2008." ZDNet's David Berlind put out a video about Planet82 sensor. Digitimes: With regard to speculation that ProMOS Technologies may work with Cypress Semiconductor for CMOS image sensor (CIS) production, ML Chen, chairman of ProMOS, said he would not deny the speculation, but further details will not be announced until after more discussions. According to ProMOS, it plans to start the new business with US$10 million in capital, and ProMOS will hold 100% of the new entity. Nevertheless, the maker is not ruling out introducing other strategic partners while ProMOS will remain the major shareholder of the company, Chen said. ProMOS announced on January 11 that its Fab 2 (a 12-inch fab) will start producing CIS. Chen said the fab will be the first choice of the new design company for CIS production and the fab will also compete for orders from other companies. The fab will use 0.11-micron technology, more advanced than the 0.18-micron now used for CIS production. The fab can produce CIS chips of three megapixel and will focus on high-end CIS, while its entry-level CIS will be taken care by an 8-inch fab in China, the company said. Although ProMOS will remain focused on DRAM, the maker still needs another revenue driver and CIS is an appropriate choice, Chen said, adding that this is why ProMOS has chosen to ally with a major IDM in the US. Besides making CIS, Fab 2 will continue manufacturing memory for consumer electronics, ProMOS said. "The size of the development team in Bracknell has doubled in size in the last 12 months and now totals 64 people. According to David Burrows, head of the Bracknell development centre, further expansion of the project design teams will see the headcount grow to around 90 people by the middle of the year. According to Burrows, the intention now is to develop sensor products for specific emerging markets. "One reason we are growing the design team here is to support these new markets, such as rear-view mirror sensors in cars and a medical application which could include a swallowable device,” said Burrows. The design centre is home to two product design groups working on sensors and camera-on-a-chip devices. It also creates semiconductor IP for use in a range of Micron products. Burrows believes the experienced engineers he requires will be available in the UK, but he also expects to look worldwide for hard-to-find skills such as analogue design. The US firm has had a development team in the UK since the late 1990s, originally involved in memory and logic product development. In the past three years it has built up expertise in CMOS imager technology and timing circuits." Not really the news, but in November 2006 Winbond announced that it has invested US$15.7M in Emerging Memory & Logic Solution, Inc. (EMLSI), a Korean company. EMLSI devotes itself to CMOS image sensor development, among other things. Solid State Technology puts a few bits of information about Korean Siliconfile. It's a rare appearence, as Siliconfile usually keeps low profile in press, despite quite impressive market success on Far East. "Based in South Korea, it has specialized in the development and marketing of CMOS image sensors since its founding in 2002. As the first Korean fabless company to export CIS devices to Japan in 2004, SiliconFile reports that its CIS devices have been designed into more than 70 handset models manufactured in Japan and in the Asia-Pacific region. SiliconFile cites strategic relationships it developed with Samsung and Dongbu, both located in South Korea, as essential ingredients to establishing a foundation for success. With all parties in close proximity and sharing the same business culture, SiliconFile believes it achieved an economic efficiency that is difficult to quantify with numbers." Digitimes: ProMOS Technologies announced that it will establish a design company focused on CMOS image sensors. Since the memory maker said it is open to investments from other vendors, industry players have been speculating that potential investment may come from Cypress Semiconductor. According to ProMOS, it plans to start the new business with US$10 million in capital, and ProMOS will hold 100% of the new entity. Saying that the market is big enough for handset-use high-resolution CMOS image sensors, company executives also mentioned that ProMOS will partner with US-based IDM on related developments. Based on this, market sources again associated the establishment of the new company with Cypress. In response, ProMOS noted that the company and its partner are already involved in production process development. According to ProMOS, it has not yet determined where to manufacture CMOS image sensors for the new design house, adding that first-phase production will start at Taiwan fabs. EETimes has another version of the same story. It tells that ProMOS Technologies is getting into the CMOS image sensor business, investing $10 million in a Silicon Valley start-up that will initially target low-density sensors for mobile phones. Like Micron Technology, ProMOS is looking to leverage its older DRAM production facilities to make the sensors, which will likely be in the 1.3 megapixel range. The first products will probably roll out in 2008, but few other details were available, including the name of the company. Other than small pixel size, it seems to be proud by a very small fill factor - quite opposite to what others are doing. Anybody can explain this? My guess is it actually collects light from a bigger area, but then transfer the photocharge into a small site to improve conversion factor. Now they call this small site an "aperture" to emphasize their uniqueness. Techtree: InSilica announced its next generation image processor INS-3510. The ISP brings full 3- and 5-megapixel DSC class capabilities to lower cost mobile phones with features previously not available such as advanced adaptive tone mapping, and full auto-functions. Using programmable architecture, additional features like special effects can be included to facilitate further customization of phones. The company believes that the new image processor with optimized firmware and tuning for all primary image sensor providers will enable handsets to use multiple sources in sensors. The parade of negative investment opinions on Omnivision goes on: Notable Calls cites Baird with plenty of negatives, following their checks that suggest 2007 could prove to be a very difficult year for the company. Omnivision's gross margin is set to fall significantly over the next few quarters, in firm's view. Their checks indicate TSMC's gross margin on sales to Omnivision are approximately 40%, and estimate there should a 20% differential between Omnivision's gross margin and that of a fabbed competitor such as Micron. At 20% gross margin, Omnivision would lose money. Per firm's checks, pricing is dismal: as low as $0.70 for VGA sensors, $2.50 for VGA modules. Omnivision no longer benefits from the tight supply environment of 2006, and excess capacity should bring pricing further down in 2007. Samsung is now the second-largest supplier of CMOS image sensors. For 2007, Samsung is targeting the lower end of the mobile phone market - Omnivision's last stronghold. Micron's recent acquisition of Avago Technologies represents further bad news for Omnivision, as it will enable Micron to target sub-1mp CMOS image sensor markets which the company so far had ignored - targeting two-third of Omnivision's current revenues. Omnivision missed two product cycles (1.3mp and 2mp) and is not gaining meaningful traction at 2 and 3mp resolutions, per firm's checks. WaveFront Coding Technology does not work and is currently experiencing "serious technology issues," per firm's checks. Yahoo-Finance quotes Notable Calls article too. I'm wondering where is Omnivision's Howard Rhodes with his magical abilities in pixel design? 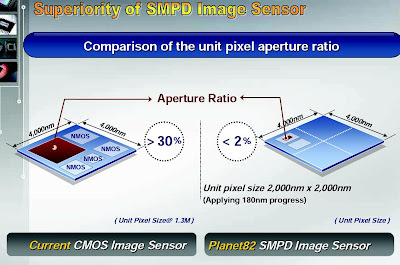 About: Photography site reports that Planet82 presents a 2Mp 'Single Carrier Modulation Photo Detector' SMPD color sensor. Last year it demonstrated VGA black and white sensor. Many in the industry were sceptical about its ability to produce high-quality color images. Now we'll see what Planet82 sensor can deliver in color. The site also mentions that the first applications for this are likely to be in CCTV, but camera phones and digital cameras are likely to follow. However, it may take some years to scale up the SMPD sensor to a suitable size for high-resolution imaging, the site states. Probably they mean small pixel size, as 2MP sensor is already quite useful in camera phones in terms of pure resolution. "OmniVision has likely lost its leadership position in the CMOS image sensor market in CY:06E largely due to continued design losses at leading camera phone OEMs for its 1.3 megapixel (MP) and above image sensors. We believe the company is still trying to recover from its product miss-steps in late CY:04 with its 1.3MP and again in late CY:05 with its 2MP OmniPixel2. We believe that in order to regain market share, OmniVision will need to compete on price, resulting in Y/Y ASP declines of roughly 30+% in FY:07E and +15% in FY:08E, compared to the overall CMOS image sensor market ASP Y/Y declines of 14% Y/Y in CY:06E and less than 5% Y/Y in CY:07E." The web is full of jokes just about anything, except image sensors. Now this deficiency has been filled. Somebody managed to combine black holes with image sensors (link). A so-so joke, but I'm not aware of any competition in this area. Chipworks already published Micron's 1.75um pixel sensor process and circuit reverse engineering reports. Truly amazing speed!